Ten pilonidal sinus patients were imaged with this handheld device prior to and post wound cleaning to monitor the presence of bacteria, guide wound cleaning, and educate the patients on home care cleaning practices. Pilonidal sinus wounds that fluoresced red (8 of 10 patients) were considered positive for bacteria and received additional cleaning. 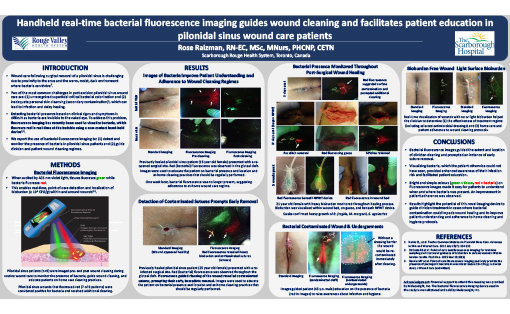 Fluorescence images identified patients with surface contamination and patients with heavy bacterial presence within and around their wound. 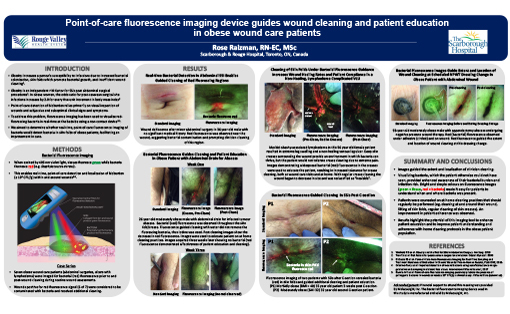 Images also revealed: contaminated sutures, prompting their early removal; fluorescence on patient undergarments (2 patients), which could immediately re-contaminate a cleaned wound; and fluorescence within a patient’s NPWT device. Images were used to educate patients on the presence and location of bacteria and to raise awareness about infection and hygiene. The simple image colours (green = tissue, red = bacteria) facilitated patient understanding of when and where bacteria were present and clinician counselling on at-home cleaning practices. An improvement in patient adherence was observed. 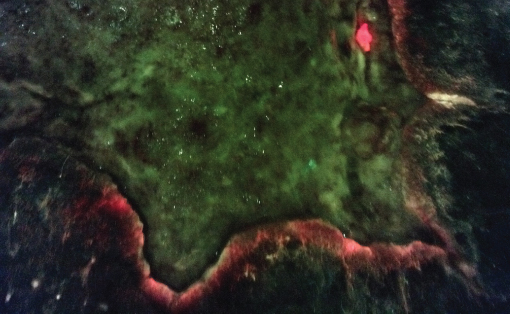 Fluorescence images guided the extent and location of clinician cleaning and prompted an instance of early suture removal. Visualizing bacteria, which the patient otherwise could not have seen, provided enhanced awareness of their infection risk. 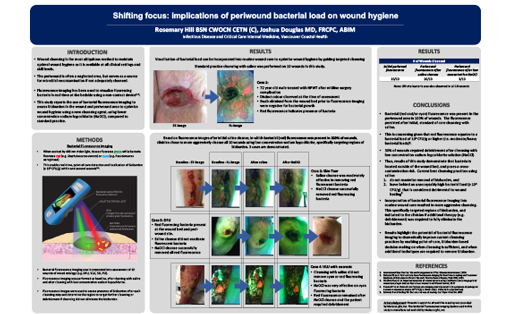 These results highlight the potential of this imaging device to guide clinician treatment in cases where bacterial contamination could impede wound healing and to improve patient understanding and adherence to at-home cleaning and hygiene protocols. Harris, Advances Skin Wound Care. 2012.